The AZURA DNPH System is specially designed to determine DNPH derivatized carbonyls. This gradient HPLC system perfectly meets even sophisticated analysis demands, robustness and quality “Made in Germany”. The system features a low pressure gradient pump for up to 700 bar, an autosampler, column thermostat and a diode array detector with 8 channels and a wavelength range from 190 – 700 nm. In the monitoring of industrial air, the determination of carbonyl (aldehyde and ketone) emissions is crucial to prevent respiratory, pulmonological, autoimmune diseases, and cancer. According to the analytical method described in the DIN ISO 16000-3 , the carbonyls must be converted to their corresponding hydrazones with 2,4-dinitrophenylhydrazin (DNPH) in order to be detected via UV detector and analyzed by reversed phase HPLC. Here, the DryLab® software was used for method optimization to separate of 13 carbonyl derivatives in a standard mixture with the AZURA® HPLC system and the DNPH-column. The main objective of method optimization in HPLC is to define the appropriate conditions for robust, precise, and reproducible analysis. In order to save resources, a computer assisted method development can be a valuable tool. For the characterization of carbonyl content in air samples, commonly a standard mixture of 13 aldehyde and ketone DNPH derivatives is used. For precise analysis a good separation of all 13 components has to be achieved. Here, the chromatography modelling software DryLab® with 3D Cube option was used for the optimization of the analysis of the cabonyl standard mixture. The investigation of the combined influence of gradient time, temperature and ternary eluent composition on critical resolution enabled the development of robust method conditions. Furthermore, the robustness space was investigated in silico and verified experimentally with a high degree of agreement. Special offer price available – Contact us! For data acquisition and analysis, the system can be operated with the software packages ClarityChrom®*, OpenLAB® EZChrom Edition* or Chromeleon®. 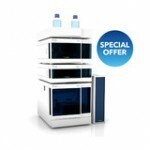 Chromatography data system and DryLab® software are not included in the offer. In addition, you can order the system installation, maintenance and training by our KNAUER experts.